This particular paper has a rather academic-sounding title, but at its heart it makes a very simple and interesting observation regarding touch that any user of touch-screen technology can perhaps appreciate. The irony is this: when interaction designers talk about “natural” interaction, they often have touch input in mind. And so people tend to take that for granted. 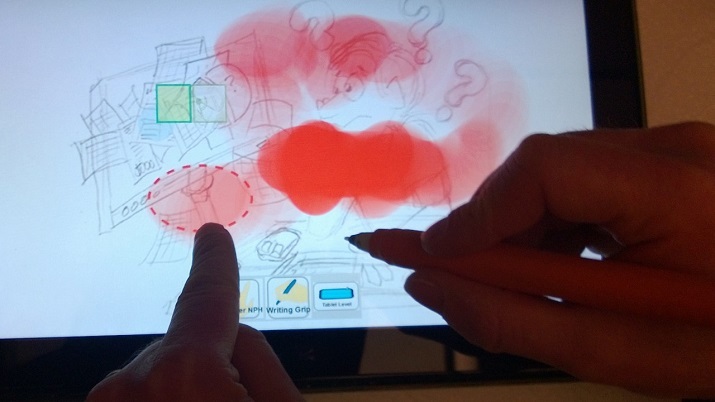 What could be simpler than placing a finger — or with the modern miracle of multi-touch, multiple fingers — on a display? And indeed, an entire industry of devices and form-factors — everything from phones, tablets, drafting-tables, all the way up to large wall displays — has arisen from this assumption. Yet, if we unpack “touch” as it’s currently realized on most touchscreens, we can see that it remains very much a poor man’s version of natural human touch. For example, on a large electronic-whiteboard such as the 84″ Surface Hub, multiple people can work upon the display at the same time. And it feels natural to employ both hands — as one often does in a wide assortment of everyday manual activities, such as indicating a point on a whiteboard with your off-hand as you emphasize the same point with the marker (or electronic pen). Yet much of this richness — obvious to anyone observing a colleague at a whiteboard — represents context that is completely lost with “touch” as manifest in the vast majority of existing touch-screen devices. Who is touching the display? Are they touching the display with one hand, or two? And if two hands, which of the multiple touch-events generated come from the right hand, and which come from the left? Well, when dealing with input to computers, the all-too-common answer from the interaction designer is a shrug, a mumbled “who the heck knows,” and a litany of assumptions built into the user interface to try and paper over the resulting ambiguities, especially when the two factors (which user, and which hand) compound one another. The result is that such issues tend to get swept under the rug, and hardly anybody ever mentions them. But the first step towards a solution is recognizing that we have a problem. This paper explores the implications of one particular solution that we have prototyped, namely leveraging wearable devices on the user’s body as sensors that can augment the richness of touch events. 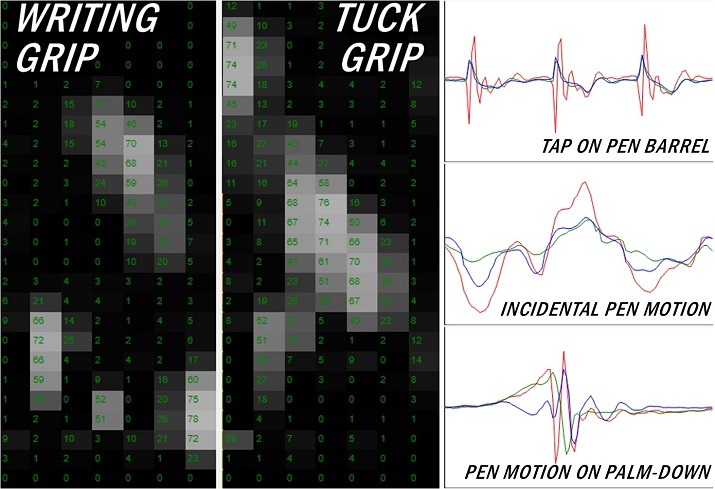 A fitness band worn on the non-preferred hand, for example, can sense the impulse resulting from making finger-contact with a display through its embedded motion sensors (accelerometers and gyros). If the fitness band and the display exchange information and id’s, the touch-event generated can then be associated with the left hand of a particular user. The inputs of multiple users instrumented in this manner can then be separated from one another, as well, and used as a lightweight form of authentication. That then explains the “wearable” part of “Wearables as Context for Guiard-abiding Bimanual Touch,” the title of my most recent paper, but what the heck does “Guiard-abiding” mean? Well, this is a reference to classic work by a research colleague, Yves Guiard, who is famous for a 1987 paper in which he made a number of key observations regarding how people use their hands — both of them — in everyday manual tasks. Left hand precedence: The action of the left hand precedes the action of the right; the non-preferred hand first positions and orients the piece of paper, and only then does the pen (held in the preferred hand, of course) begin to write. 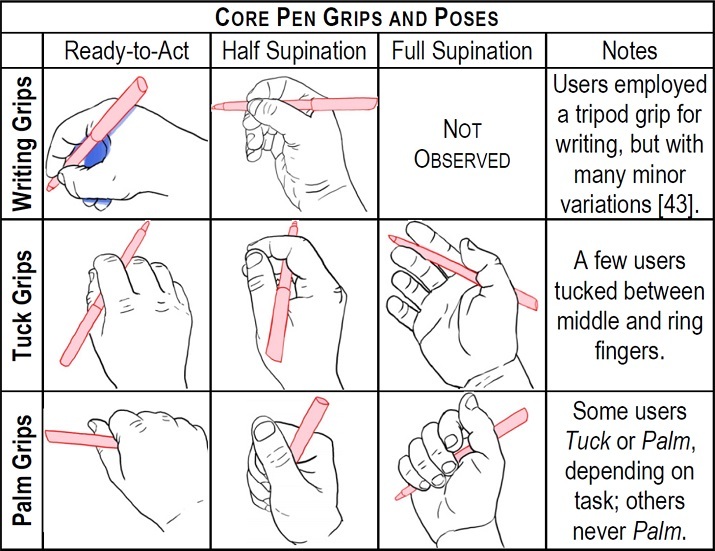 Differentiation in scale: The action of the left hand tends to occur at a larger temporal and spatial scale of motion; the positioning (and re-positioning) of the paper tends to be infrequent and relatively coarse compared to the high-frequency, precise motions of the pen in the preferred hand. 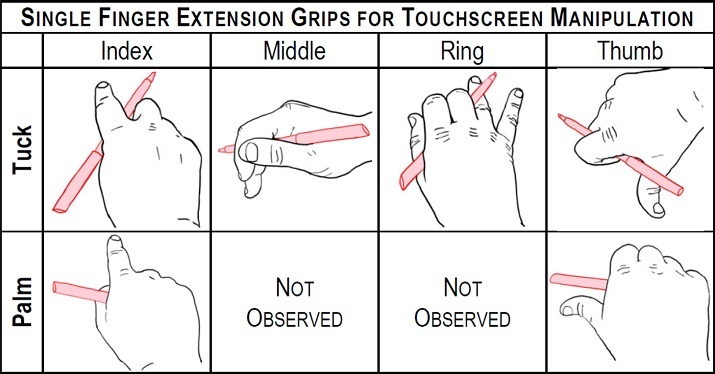 Right-to-Left Spatial Reference: The left hand sets a frame of reference for the action of the right; the left hand defines the position and orientation of the work-space into which the preferred hand inserts its contributions, in this example via the manipulation of a hand-held implement — the pen. Well, as it turns out these three principles are very deep and general, and they can yield great insight into how to design interactions that fully take advantage of people’s everyday skills for two-handed (“bimanual”) manipulation — another aspect of “touch” that interaction designers have yet to fully leverage for natural interaction with computers. This paper is a long way from a complete solution to the paucity of modern touch-screens but hopefully by pointing out the problem and illustrating some consequences of augmenting touch with additional context (whether provided through wearables or other means), this work can lead to more truly “natural” touch interaction — allowing for simultaneous interaction by multiple users, both of whom can make full and complementary use of their hard-won manual skill with both hands — in the near future. 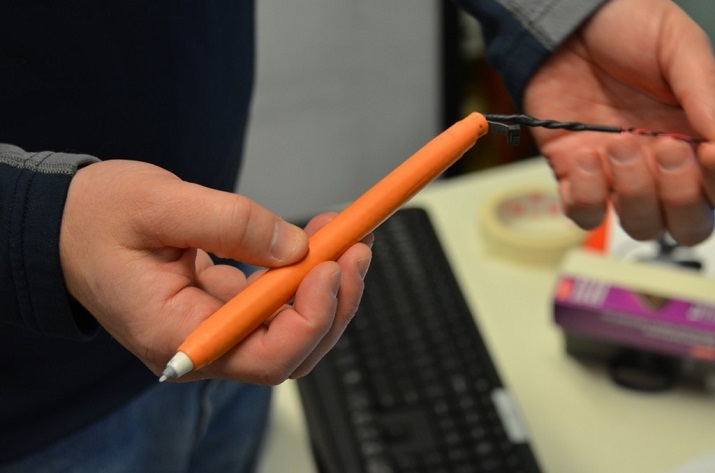 “Pen” and “Touch” are terms that tend to be taken for granted these days in the context of interaction with mobiles, tablets, and electronic-whiteboards alike. 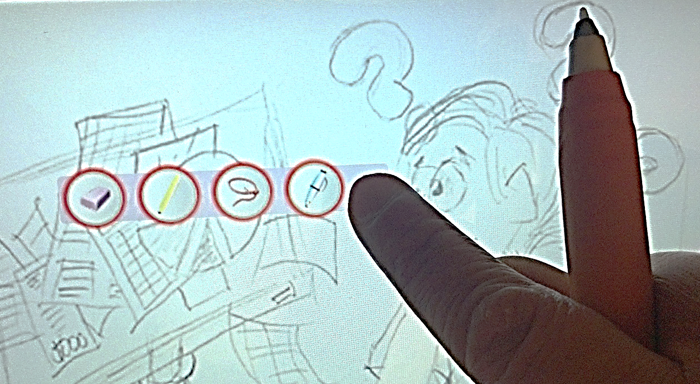 Yet, as I have discussed in many articles here, even in the simplest combination of these modalities — that of “Pen + Touch” — new opportunities for interaction design abound. And from this perspective we can go much further still. What does this term really mean in the context of input to computers? Is it just when the user intentionally moves a finger into contact with the screen? Or how about the off-hand, which plays a critical but oft-unnoticed role in gripping and skillfully orienting the device for the action of the preferred hand? Isn’t that an important part of “touch” as well? Well, there’s good reason to argue that from the human perspective, these are all “touch,” even though most existing devices only generate a touch-event at the moment when a finger comes into contact with the screen. Clearly, this is a very limited view, and clearly with greater insight of the context surrounding a particular touch (or pen, or pen + touch) event, we could enhance the naturalness of working with computers considerably. This chapter, then, works through a series of examples and perspectives which demonstrate how much richness there is in such a re-conception of direct interaction with computers, and thereby suggests some directions for future innovations and richer, far more expressive interactions. P.S. : I’ve linked to the draft of the chapter that I submitted to the publisher, rather than the final version, as the published copy-edit muddied the writing by a gross misapplication of the Chicago Manual of Style, and in so doing introduced many semantic errors as well. Despite my best efforts I was not able to convince the publisher to fully reverse these undesired and unfortunate “improvements.” As such, my draft may contain some typographical errors or other minor discrepancies from the published version, but it is the authoritative version as far as I am concerned.